We are committed to safe use of All Terrain Vehicles. Tao Tao ATVs meet or exceed the ANSI Standard as required by LAW (SIA of 2008). In the interest of safe use of Youth Model ATVs we have deleted "Toy Type" headlights in order to discourage night riding and conform to government regulations. By purchasing any items from our website or in person at our store location, I, as buyer, acknowledge and agree to be above 18 years or age or are the parent of a child under the age of 18 years. I, as buyer, acknowledge and understand that riding an all-terrain-vehicle (atvs), dirt bikes, go karts, motorcycles, mopeds, and gas scooters is a dangerous activity that requires strenuous exercise and various degrees of skill and experience for individual riders. I, as buyer, understand that these activities can result in serious injury to the person and damages to property and voluntarily assume any and all risk associated with loss, damage or injury while riding the vehicles advertised on our website. I, as buyer, am aware of the risks, hazards and dangers of personal injury, death and disability inherent with the specific use of these vehicles as well as the inherent risks, hazards and dangers of personal injury and disability increase with inexperienced riders. I, as buyer, agree to release and forever discharge 360POWERSPORTS.COM or its parent company and their agents, servants, employees, officers, directors, trustees and all other persons or entities acting on their behalf and the manufacture from any and all claims, actions, damages, liabilities, cost or expenses and attorney fees which are related to, arise out of, or are in any way connected to your participation or use of these vehicles, use of equipment or property supplied by 360POWERSPORTS.COM or its parent company or your presence upon the premises , whether or not such claims, actions, damages, liability, cost or expenses are caused by the negligence of the seller, manufacture or distributor. By this Agreement, it is my intention as buyer, to surrender and waive any rights to sue or exercise any legal rights to seek damages from 360POWERSPORTS.COM or its parent company and their agents, servants, employees, officers, directors, trustees and all other persons or entities acting on their behalf. This Agreement shall be affecting and binding upon my heirs, agents, personal representatives and assigns. I, as buyer, hereby certify that I am over the age of 18 years of age. I, as buyer, have carefully read the foregoing and acknowledge that I understand and agree to all the above Terms and Conditions. I have had the opportunity to ask any and all questions regarding this Agreement and the effect of the same. I, as buyer, am aware that by purchasing this item and sending/remitting payment for it/them, I assume all risk, and waive and release certain substantial rights that I may have or possess. I, as buyer, therefore release all liability and waive all rights I may have in regards to my child's activities with any items purchased from 360POWERSPORTS.COM. The entire content included in this site, including but not limited to text, graphics or code is copyrighted as a collective work under the United States and other copyright laws, and is the property of $(360POWERSPORTS.COM ). The collective work includes works that are licensed to $(360POWERSPORTS.COM). Copyright 2003, $(360POWERSPORTS.COM) ALL RIGHTS RESERVED. Permission is granted to electronically copy and print hard copy portions of this site for the sole purpose of placing an order with $(360POWERSPORTS.COM) or purchasing $ (360POWERSPORTS.COM) products. You may display and, subject to any expressly stated restrictions or limitations relating to specific material, download or print portions of the material from the different areas of the site solely for your own non-commercial use, or to place an order with $( 360POWERSPORTS.COM ) or to purchase $(360POWERSPORTS.COM ) products. Any other use, including but not limited to the reproduction, distribution, display or transmission of the content of this site is strictly prohibited unless authorized by $(360POWERSPORTS.COM). You further agree not to change or delete any proprietary notices from materials downloaded from the site. This site and the materials and products on this site are provided "as is" and without warranties of any kind, whether express or implied. To the fullest extent permissible pursuant to applicable law, $( 360POWERSPORTS.COM ) disclaims all warranties, express or implied, including, but not limited to, implied warranties of merchantability and fitness for a particular purpose and non-infringement. $( 360POWERSPORTS.COM ) does not represent or warrant that the functions contained in the site will be uninterrupted or error-free, that the defects will be corrected, or that this site or the server that makes the site available are free of viruses or other harmful components. $(360POWERSPORTS.COM ) does not make any warrantees or representations regarding the use of the materials in this site in terms of their correctness, accuracy, adequacy, usefulness, timeliness, reliability or otherwise. Some states do not permit limitations or exclusions on warranties, so the above limitations may not apply to you. (360POWERSPORTS.COM ) shall not be liable for any special or consequential damages that result from the use of, or the inability to use, the materials on this site or the performance of the products, even if $( 360POWERSPORTS.COM ) has been advised of the possibility of such damages. Applicable law may not allow the limitation of exclusion of liability or incidental or consequential damages, so the above limitation or exclusion may not apply to you. In the event that a $(360POWERSPORTS.COM) product is mistakenly listed at an incorrect price, $(360POWERSPORTS.COM) reserves the right to refuse or cancel any orders placed for product listed at the incorrect price. $(360POWERSPORTS.COM) reserves the right to refuse or cancel any such orders whether or not the order has been confirmed and your credit card charged. 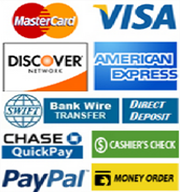 If your credit card has already been charged for the purchase and your order is cancelled, $(360POWERSPORTS.COM) shall issue a credit to your credit card account in the amount of the incorrect price. If any of our items are not in stock or back order we have the right to ship you a similar item to you. We will ship you an identical item at no extra cost to you. It may be very similar but not the exact one as pictured at ourweb site. These terms and conditions are applicable to you upon your accessing the site and/or completing the registration or shopping process. These terms and conditions, or any part of them, may be terminated by $(360POWERSPORTS.COM) without notice at any time, for any reason. The provisions relating to Copyrights, Trademark, Disclaimer, Limitation of Liability, Indemnification and Miscellaneous, shall survive any termination. Once we have shipped the merchandise customers are responsible for arranging pick up, receiving delivery notification, scheduling a pick up by Estes express, not doing that or refuse to pick up the merchandise will result in occurring shipping charges, storage fees, Customer will be responsible for shipping and handling from 360POWERSPORTS.COM ... They will be held liable for the original shipping cost plus if they refuse or are unable to reach by our shipping company they must be held responsible for storage fee shipping back and from to our warehouse 76010 no exception. (360POWERSPORTS.COM ) may deliver notice to you by means of e-mail, a general notice on the site, or by other reliable method to the address you have provided to $( /360POWERSPORTS.COM ). Shipping cost of sending us back the defective part from you to us or vice versa.The cost of third-party labor and any additional parts required to remove the defective parts and to complete installation of a replacement part. The product is completely and correctly assembled by any end users, including tightening and checking of all bolts, nuts, and screws. AND LOCK TIGHT THEM ACCORDINGLY. All of our units shipped new 100% inspected in a metal crate and customer must assemble it once they receive the unit... Please call 469 217 7070 if you need any assistance on how to assemble it thank you. Customers must send us the parts back in order for us to the warranty. We do not pay for the shipping of parts back and forth. We will warranty the parts after we received the parts from our customer. Returns will be accepted without showing signs of wear or damage in any way customers must send us the old parts back NO EXCEPTION. Hi our Return address is as follow !